When fragrance oils are added to the high pH environment of cold process soap batter, interesting things can happen. Fragrance oils have the potential to cause ricing, acceleration and even separation. That’s why it’s important to only use fragrance oils that have been tested in cold process soap. Bramble Berry has an extremely thorough testing process to make sure all our fragrance oils behave well. We only bring in the best of the best! Acceleration is perhaps the most common issue caused by fragrance oils in soap. Acceleration is when the soap batter thickens more quickly than usual. Sometimes acceleration can be quite extreme, or it can be a slight. Depending on the design of your soap, acceleration can be a good or bad thing. If your soap requires a thick trace, an accelerating fragrance oil can be helpful. If the design requires lots of time to work in order to create swirls, an accelerating fragrance oil can be a huge problem. 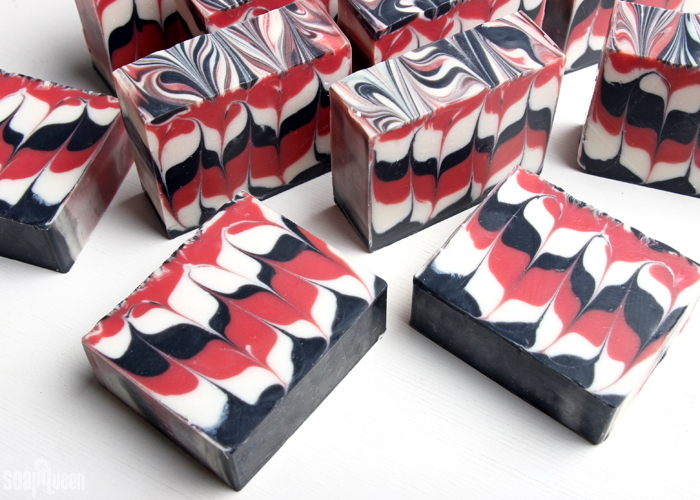 Non-accelerating fragrance oils are important for creating swirl techniques, like in the Red Hanger Swirl Cold Process Soap Tutorial. If you’re looking for a non-accelerating fragrance oil, check out the list below! 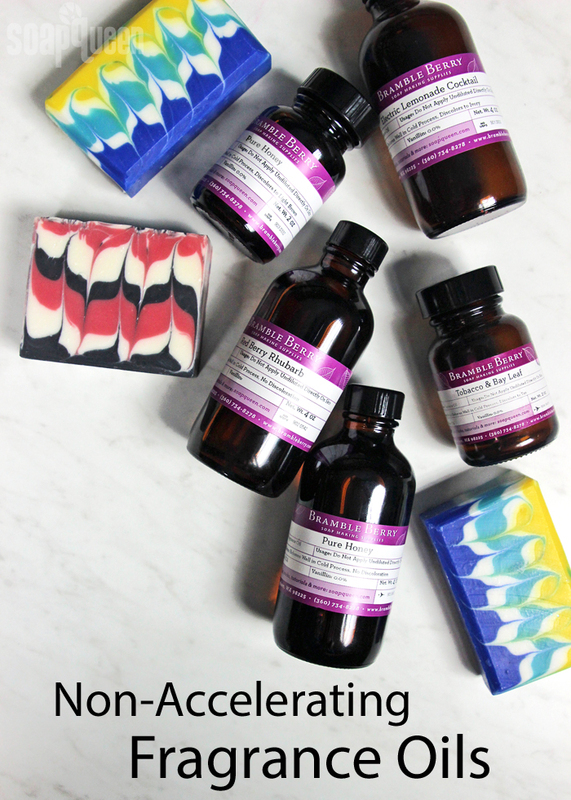 According to our tests, these fragrance oils will not cause your soap to accelerate. That being said, keep in mind other things can lead to acceleration, including the oils in your recipe, temperatures and additives. Learn more about how to manipulate the trace of your soap and avoid acceleration in this post. Do you have a favorite well-behaving fragrance oil? When I’m making a complicated swirled recipe, some of my go-tos are Energy, Blackberry Sage Cybilla, Tobacco & Bay Leaf and Yuzu. We do not have a list of all the accelerating fragrance oils right now. This list shows all of our fragrance oils we know to cause no acceleration at all which are great especially for beginners. If you want to double check how a different FO performs you can look at its product page to read the performance notes. Lemon cake fragrance is on this list, however, it accelerated so quickly making CP soap. Temps and my usual ingredients were ideal. I simply whisked FO into it and while pouring, it quickly became so thick that I had to spoon it out like frosting. Hello, can you please publish a list on ESSENTIAL oils that dont accelerate trace? thank you! I am Scott Anderson and would like to make an order of ( FRAGRANCE OILS ).. Send me the types of oils with a link to your oils. Also advise if you accept credit card payment. I just finished using Ginger Lime for the first time. It seized so quickly that I was unable to swirl it. My recipe consists of 25% coconut oil, 41% Olive oil, 4% Beeswax and 29% Palm oil. For coloring, I used Aqua mica to color the swirl. I added the oil and lye together when they were both around 115-120 degrees. What made it seize? I poured the main mixture at a thin to medium trace. When I finished pouring, it was already getting very thick. The green mixture traced to a thick trace as soon as I started mixing the fragrance and coloring into it. I am thinking it was the Ginger Lime because the oil mix is the one I always use. Thank you for the list. I love having handy instead of having to read through all the reviews. I am copy the list to an Excel spreadsheet and mark whether or not they discolor to make it even more useful. I’ve ordered the blueberry because I had a customer request. with the way it discolors, what would I need to do to get my soap something blue or purplish?? Can you make this list in a printable that can easily be kept handy when planning recipes? I’d love to post it on a board for quick reference. Thank you for this list! I asked for such a list some time ago in one of the Teach Soap forums and am glad to see it here. My last batch combined Blueberry and Blooms and Berries, and it did accelerate somewhat. So now I can consider Blooms and Berries the #1 suspect on that one. The bars still came out pretty good and smell amazing. Oh, and Pure Honey does too, if you accidentally use stick blender for it. Probably fine if just whisked in. Tropical Punch also accelerates. Not bad or unworkable, but it definitely does. We have found that one performs really well in cold process soap! Other factors can cause acceleration. Can you tell me a bit more about your recipe? Also, are you using any additives like clay or sugar? I don’t have it handy now, but it’s a simple recipe something like 30% olive, 25% Palm, 25% coconut, 10% avocado oil, 7% Shea butter, 3% castor. 5% FO used. No clays or any other additives, only a little bit of mica for each color. And just barely whisked in fragrance. It definitely accelerates, but like I said it’s still workable just fine and it smells strong and awesome. Pearberry also accelerates badly, unfortunately so since it is a great fragrance. Kelsey Pearberry is still on the list? Is it an accelerator or a non accelerator? Now I’m confused. Perhaps we could have a second list of KNOWN Accelerating FO’s and what type of recipe they work best with including light on the stick blender and only whisking in the fo. I was surprised to see Energy on this list. It always accelerates in cold process on me: so much that I only use it in hot process or liquid soap. I use very common oils, no clays and usually soap around 100 – 120 F. Is it just me? Anyway, this list is an excellent idea and thanks for posting. Other factors can cause acceleration. Can you tell me a bit more about your recipe? Also, are you using any additives like clay or sugar? Having this list is great! However I have to say that Apple jack Peel totally rices and accelerates. I’ve tried it twice and both CP batches were a complete loss. My applejack peel seized quickly also, but I blamed myself for this. I use goat milk and add it to my oils to prevent scorching. However, it wasn’t until I blended my soap to the perfect trace for swirling that I realized I’d forgotten to add the milk. I quickly added it and my soap immediately seized. I got it into my molds but was only able to layer it. It smells wonderful and it’s pretty, just not what I was trying to do. Like I said, I blamed myself. Hmmmm 🤔. I love the smell so I’d still buy it again. I was also surprised to see Applejack on the list. My experience is that this accelerates very quickly.